A cruise includes everything from transport, accommodation and food to entertainment and even childcare. By offering all this, it makes cruising ideal for the entire family. There are plenty of family activities designed to keep everyone happy. There are also a fair amount of activities that specifically cater for children and teens so parents can get a break too. While all cruises offer fairly standard supervised schedules, there are some ways in which some lines differ. Making yourself aware of these differences will help you make the best choice for everyone. You are offered a four-tiered programme combining entertainment and education through fun activities. They also offer in-room babysitting and activities include everything from slumber parties and talent shows to science experiments. There are some areas reserved for “kids only” like movie theatres, teen centres, clubhouses and pools. Safety and security are a priority and, in some cases, family-friendly shore excursions and group babysitting is also available. Queen Mary 2, Queen Victoria and Queen Elizabeth 2 do not offer private babysitting but they do have trained, professional nannies as well as complimentary group babysitting during the evenings. Children as young as one may attend the nursery without their parents and children from ages 1 – 6 are allowed in the Play Zone. For older children, the Zone is the place to be. Different times are allocated for various age groups. Ages 7 – 12 and 13 – 17 are grouped separately and allowed access at different times. Disney ships are one of the top options for travellers looking for family fun. Disney ships are often referred to as floating theme parks and the Disney theme is non-stop. Just about an entire deck is designed and dedicated to kids and there’s is constantly something to do for five different age groups. There are also pool areas restricted to adults only so parents can get a real break away while their kids are being entertained. This along with events and family activities (i.e. game shows and shore excursions) make sure that there is zero chance of boredom. There is also a nursery available but be advised to book early because it tends to fill up fast. Holland America Line have reinvented the popular “Club HAL” which is named after Hal, its dolphin mascot. There are new supervised play areas and activities designed for different age groups. Children from 3 – 12 can enjoy all sorts of fun while separate activities are available in The Oasis (this space includes hammocks, laser lights and a waterfall). The Loft attracts the teens on board with its video games, movies and internet access. A separate club for ages 8 – 12 (also referred to as tweens) offers theme parties, arcade games and mini golf. On MSC Cruises you kids under the age of 17 are allowed to sail for free. They also feature the complimentary MSC Kids Club which is divided into the Mini Club (ages 3 – 9), the Juniors Club (ages 9 – 12) and the Teenagers Club (ages 13 and up). Each club offers age appropriate activities and teens are able to use a My Teen card for on board, pre-paid spending! MSC offers a number of family activities like mini golf, tennis, swimming, volleyball and basketball. There has been a change from P&O Cruises party ship reputation and they are now gearing up for the kids. Groups are divided according to ages as is to be expected. 2 – 4 years can join Splashers, 5 – 8 year olds are grouped together as Surfers, 9 – 12 year olds are Scubas and H2O is for 13 – 17 year olds. Activities like jewellery making and fun mini-Olympics are all supervised by the Reef Rangers and parents are able to keep in touch with their kids by pager. P&O also offers plenty of shore excursions perfect for families. With Princess Cruises, they have recently expanded their youth programme to include age-specific activities. These include disco nights, t-shirt painting, movies and ice cream parties. There are also educational activities as well as group babysitting. 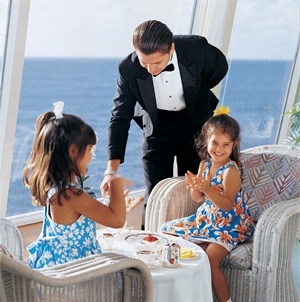 Children are welcome on all of their ships but each ship offers different facilities. Royal and Pacific Princess Cruises do not have dedicated Youth and Teen Centres but there are always supervised activities scheduled on all the ships. These cruises host a wide range of fresh and fun activities for young passengers. Rock climbing, ice-skating and even surfing lessons are all available on board. The newer ships like Oasis of the Seas and Allure of the Seas include the “Boardwalk” neighbourhood. This is a tribute to old-style seaside theme parks. They feature an arcade and the very first at-sea carousel. Group babysitting is available the Adventure Ocean programme is available and supervised throughout the year. It is also divided into five groups based on age.